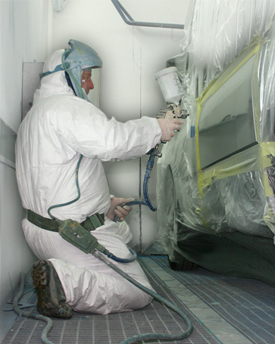 At Imperial Bodycraft our large workshop comprises of separate preparation and spraying areas. The preparation area can accommodate many vehicles and enables our trained staff to complete full re-builds, specialist detailing or general repairs simultaneously. Perfect finishes are achieved by 2 modern low bake ovens, one large enough to accommodate light commercials, the other used for smaller vehicles or components. Imperial Bodycraft will undertake all spray paint scenarios to meet customer requirements, no matter how large or small. Our trained staff will be pleased to discuss individual requirements, including specialist paint finishes, to ensure customer expectations are fully met by our guaranteed work. Call Imperial Body Craft for Free Advice or a Free Quote.